The winner of last week’s coolest gadget competition is the Thumb Saver. This gadget is so simple but makes so much sense and it seems to solve an age old problem that everyone has just become accustomed to. 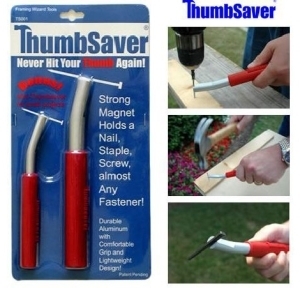 The Thumb Saver is a great invention which through a magnet holds any type of nail in place so you can hammer it in without any bruised, bloodied or broken fingers. Congrats again to Tech Styling. In second place we have the DIY: Lego Movie Theater Features Working Projector. In what is without a doubt the coolest Lego project I have seen in a long while, builder Ricardo Oliveira has built a Lego movie theater, complete with a tiny 24 fps projector. The biggest surprise was that the thing actually worked, had I not seen the video I might have dismissed it as April Fool’s day foolishness; it is real. The level of detail in the theater is incredible, right down to row designations on the seats and cups for the patrons. Finally in third place comes the Instant phone backup. How annoying is changing phones and having to get all your contacts onto your new handset? Moving all your contacts onto your phone memory or SIM, taking phones apart, swapping SIMS (if your new handset’s not locked), yadda yadda. It’s got a lot quicker with the use of software and a computer but don’t you just wish it could be instant? Well now, thanks to this little gadget, it is. Want to hear about future contests first? Subscribe to our daily digest via email or RSS. If you write for a gadget themed blog and wish to be included in next week’s contest check out the CGOTW instructions page.